A sister and brother must deal with their parents' divorce in this Danish family drama. It is set during the Berlin crisis in 1962. 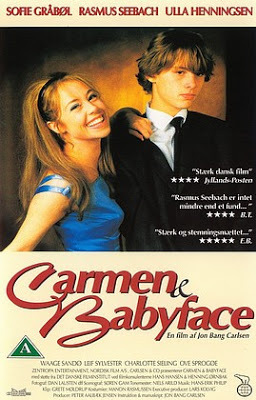 Carmen, the nervous one, and her brother Adrian, aka Babyface, lead happy lives. Their father is a ceramist, and their mother is an earth momma. After their pappa runs away with an apprentice, the family harmony is shattered. The devastated mother and her children move to a drafty old cottage in the country. The children are outcast by their new schoolmates. Carmen avoids them, but Adrian is bullied. He finally does find a friend, but the friendship is temporary. Adrian's teacher finally provides him the nurturance he craves. An electrical storm brings ominous developments to the little family. Cast: Joen Bille, Erich Brandt, Aksel Erhardtsen, Kenneth Friis, Sofie Gråbøl, Ulla Henningsen, Kai Løvring, Rikke Løwenstein, Waage Sandø.